The first pipeline of TurkStream entered the Turkish Exclusive Economic Zone (EEZ) on 4 November 2017. Pioneering Spirit, the world’s largest pipelay and construction vessel, marked the occasion by laying down a section of the pipeline on the seabed with Russian and Turkish flags, symbolising the crossing of the EEZ border between the two countries. "TurkStream pipeline enters Turkish Economic Exclusive Zone"
The border crossing also marks the completion of construction of the two offshore lines within the Russian EEZ. In total 448 km of the pipeline were laid down, equally divided over the two lines. Construction of nearly 25% of the offshore pipeline section has been realized in less than six months. This is in line with the planned construction schedule. First gas is expected to flow through TurkStream in December 2019. After reaching the border of the EEZ with one line, Pioneering Spirit returned towards Anapa to commence deepwater pipelaying with the other line. Allseas’ vessel Audacia had already finalized the shallow water section for both lines late July. 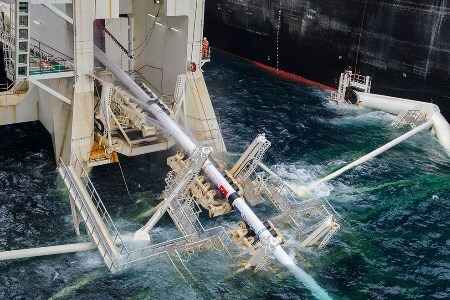 Due to the chosen order of pipelaying it was possible to finalise the main offshore construction activities in the Russian EEZ in one campaign. Pioneering Spirit will now continue the pipelay activities with one pipeline all the way close to the Turkish landfall. The two TurkStream pipelines will come ashore in Turkey near the town of Kiyiköy, which is located approximately 100 km west of Istanbul. The average speed of pipelaying by Pioneering Spirit is in excess of 4 km/d, with a record set by the Allseas crew on 1 November 2017 by constructing 5.15 km of Turkstream pipeline in one day. The water depth at the EEZ boundary is approximately 2171 m, which is close to the deepest part of the TurkStream route (2198 m).